Are you considering a doula in Edmonton or the surrounding area? 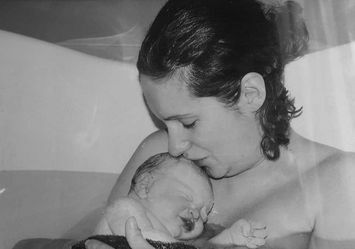 Browse our services and our philosophy, which supports all hospital births with physicians, as well as birth centre and planned home births with midwives. Completely pressure free, we meet to see if our services are right for you. You may take all the time you need to decide. We wait for you to contact us. This visit can take place at any time during your pregnancy. Two more doula visits after you hire our services. The first time will be to discuss at length your philosophy and expectations regarding labour and birth, and our general role. We will prepare your birth preferences, which include individual philosophies you have regarding pain relief, and choices with regards to relaxation, breathing and visualization techniques, and positions for labour. At this time, the contract will be signed. The second time will take place at approximately 4 weeks prior to your due date, and will take place in the comfort of your home. This will be a review of what will happen during your birth experience and our role within it. We will discuss natural comfort measures, differences between pre-labour and labour, optimizing foetal positioning, when to time contractions, and when to contact us. Birth partners are shown how they can be as involved as they wish so that the birth experience is positive for both of you. Private Pre-Natal Preparation Session for non-doula clients (separate fee). Please contact Suzanne for more information. Continuous support during your labour and birth. You will most likely go through a full circle of emotions at your birth. On one hand, you may feel excitement, and the other, fear. Our role as a doula is to help you cope with all the fears and anxieties you and your partner may have. A doula is not only sympathetic but is informed as well. We can help you remain calm, relaxed, and comfortable until labour is well established. This is a quiet and calm presence and reassurance. You will find that generally, the birth partner is not only there for emotional support, but is more involved with your labour due to the pressure of the unknown being removed as the doula reassures and comforts both of you. We also know when to stay in the background to allow privacy when you are doing well. Comfort measures may include physical ones, an extra practical hand, and professional information at all times, as hospital staff are kept busy with other patients. Post-natal visit done in the comfort of your home. Immediately after the birth, it is important that you have bonding time with your baby. We will absolutely respect this. We will be on call for you and then meet again in your home in the next few weeks to briefly review your birthing experience and our role as your doula. At this time, we can assist you further with breastfeeding, and with any other questions you may have. Photographs and/or a timeline of your birth. 24-hour on-call support throughout your pre-natal and postpartum experience. Be reassured that you can ask us anything, at any time of day. This is one of the most wonderful advantages of having a doula. Contact Gentle Touch today to see if we’re the right fit for you. Let’s meet to decide if we’re the right fit for each other.